This entry was posted on May 8, 2018 by Kristina. Beautiful inside and out, Princess Belle from Beauty and the Beast shines in the yellow dress that everyone identifies her by. Her classic ball gown has been idolized by girls who grew up with the Disney classic, which makes us all of us, considering the numerous remakes of this iconic tale. The most recent installment of Beauty and the Beast features Emma Watson, who is frequently recognized as one of the top celebrity trend setters of 2018. While many young girls love dressing up like Belle in Disney World or for Halloween, us more mature ladies can still find plenty of reason to show our own inner Princess. 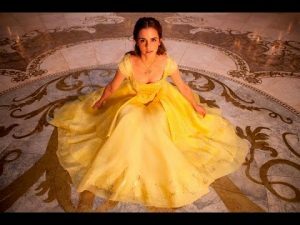 If you really love Belle's yellow ball gown style then you've probably been searching for the perfect yellow dress for Prom, Homecoming, or whatever your special occasion may be. To get a modern swing on this timeless style check out style 42044 from world renowned fashion housee Mori Lee. This darling ball gown showcases a flawlessly beaded neckline, as well as an off-the-shoulder scalloped lace ruffle that drapes glamorously over the fitted bodice. Pair this stunning dress with our yellow satin evening gloves to complete this perfect ensemble and ensure that you'll be the "Belle" of the ball.